Will this dispenser work with every type of lid? These lid dispensers are designed for use with flat, cold beverage lids only. Due to the wide variety of lid sizes, shapes, and styles available, exact fitment cannot be guaranteed for every lid. Please contact our Customer Solutions team with the brand and model of your lids prior to placing your order if you have questions about compatibility. 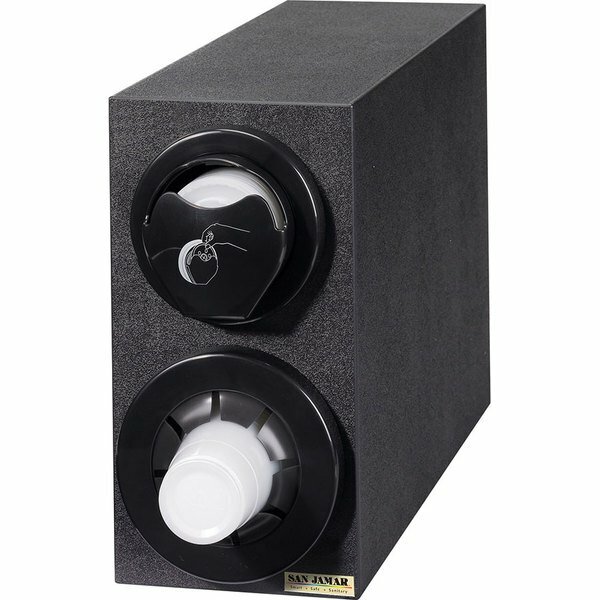 Perfect for self service stations at your convenience store, coffee shop, or concession stand, this San Jamar L22C2951BK Sentry dual tube countertop cup and lid dispenser holds both foam, paper, or plastic cups from 8 oz. to 48 oz., with rim diameters of 3 1/8" to 4 1/2", as well as matching 2 3/4" to 3 3/4" diameter lids. The bottom mounted cup dispenser tube features adjustable Lifetime Lever tabs that allow for quick, easy size adjustments and prevent damage to cup edges, which can result in leaks and spills. The top mounted lid dispenser tube provides a simple, more sanitary lid handling solution than simply stacking lids on coutnertops. 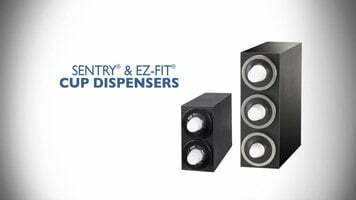 Thanks to its stylish black polystyrene exterior, the San Jamar L22C2951BK Sentry countertop cup dispenser is both durable and light weight. It is intended for flat, cold beverage lids only.